The 2018 Subaru Impreza is a compact car available in sedan and hatchback bodystyles, slotting below the mid-size Legacy is Subaru’s car lineup. Standard all-wheel-drive sets the Impreza apart from many of its front-wheel-drive only competitors. With its recent redesign Subaru addressed past weaknesses of the Impreza, including fuel efficiency, comfort, and refinement. The popular Subaru Crosstrek is a lifted version of the Impreza hatchback with a few rugged styling details that mimics the look and feel of a compact SUV, but fuel mileage suffers as a result. The 2018 Subaru Impreza is an overall well-rounded, no-frills compact car. Prices for the 2018 Subaru Impreza start at $18,495. Summary: Offering all-wheel-drive with comparable fuel economy to its front-wheel-drive competitors provides the 2018 Subaru Impreza a major advantage. 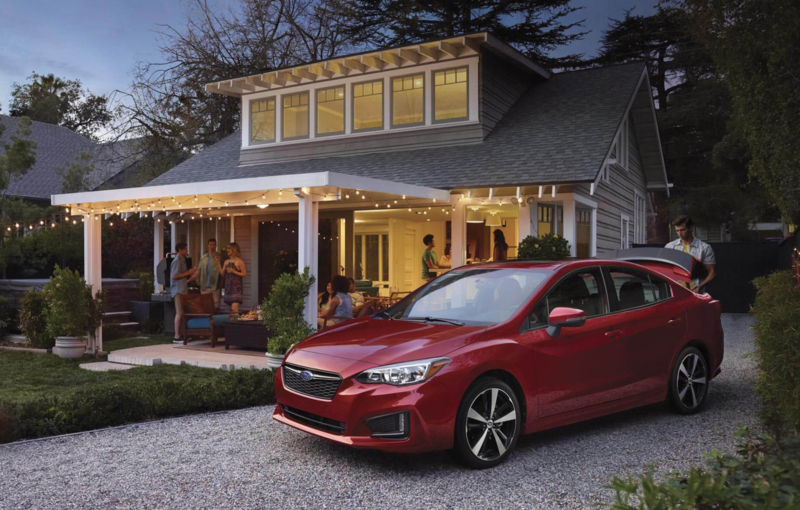 With its roomy interior and host of available advanced safety options, the Impreza is a top pick for the compact car segment. Enthusiast drivers should check out the Subaru WRX, a Volkswagen Golf GTI competitor, which ditches the fuel-efficiency focus for a high-performance engine and a spirited and engaging driving experience.